So, was Jenkins briefing Caro on the 'power structure' at Carlton ? wow. that's hectic if she was. Pretty sure it’s been mentioned on here that Jenkins was rumored to be Caro’s source within Carlton. wowee ... that's the first i've heard about that. it's funny. I did hear (from a good journo mate): internally after the freo game that SOS took umbrage with bolton in a one-on-one meeting about the amount of effort BB is extracting from the playing group and it needs to improve dramatically. ... at the time, i thought it sounded like fairytale stuff, bcos what authority would sos have to deliver one-on-one meetings with the coach? if sos has much more power – the kind caro intimated about – maybe there was some legs to that little story after all? I'm sure there would be chats going on with the coach about players on the list. If it was a one on one, then how does this journo mate hear the conversation. apparently it was quite a heated talk, and news of it went around the club and that is how my friend heard about it. the thought of a list manager dressing down a coach didn't add up for me, so i never took much notice of it. but now with all the dirt about a leak at the club and caro's info and sos being all triggered by it. it's totally plausible, imo. Tom Elliott having his say on the Prez and the Board Director appointment process. Hope he knows the club's constitution or it doesn't hold much weight. I wish it were motive for getting a ticket together and running....but it's not. Those days....for so many good Carlton people are long gone. LoGiudice made a point of referencing Carlton's strong off-field position; with the biggest corporate network in the league and a 55,000-strong membership base in 2018, a feat the club had never before achieved. "If they've joined this year, they're going to join next year and the year after." Are you sure they won't! I can’t believe the level of growth in our membership numbers given one of our worst losing streaks in our history. As famous Hawaiian Detective Harry Hoo said, “present two possibilities” either they have held back membership numbers from the pre-season and drop fed those numbers through the course of the year, or we have very resilient and optimistic members. Actually there are more members with brains that can see were we are going and not the sad sacks that constantly have negative thoughts! Depressing people that constantly bag everything CFC , and i am starting to wonder whether some of the posters on here are actually CFC supporters or just trolls!! I certainly think supporters have every right to question the decision making processes at the club. Part of the problem has been that Carlton people have sat back and acquiesced to everything these fat cats do and say and we've lost a little bit of our soul in the process. As for renewing...not sure I'll do that next year...maybe in 2022 when LoGiudice steps down. I’m not a total grump. I did aggressively cheer on Jeffy Garlett as he ran in that goal in the 2013 Elimination Final. not sure I'll do that next year...maybe in 2022 when LoGiudice steps down. so, you're not sold on him? Thanks to auto-renew, I’m the first member to join (jointly) every year. It’s not abnormal for a board to replace themselves without reference to the members. It’s generally when the board is clearly not doing their job do members then engage in hostile board challenges. 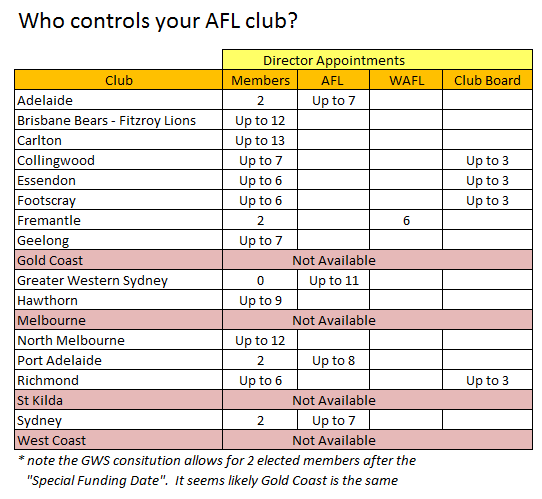 Its also not abnormal these days for club boards to be able to appoint a certain number of board members themselves with a specified number - generally 3 - being allocated to the board at several Melbourne clubs. Note as of the 2015 amendments Carltons max board is now 8. Last edited by The_Wookie on Wed Jul 18, 2018 9:27 pm, edited 1 time in total. I am calling BS on this one. SOS was on the Sunshine Coast when Carlton played Fremantle. It is not as bad as you are lead to believe.......it is %$#^& worse!!! Searching for players in the bush. haha. after the freo game, doesn't necessarily mean in the sheds right on full time. it was after the game and before the next one. ... we did come out and play with tons of effort in the very next two games with the pies & port too. then of course we had brisbane; and i'm not sure if it's just me, but the brisbane game has seen an elevation in the pressure around the club. Brisbane isn’t a bottom 4 club on form. living on the GC i've seen as much of the lions play this year as i have carlton. even when they were losing, they were in every game. you could see a game plan, you could see the way they wanted to play, and most of all you could see the players buying into it. brisbane are on a really similar trajectory to us, with all these high draft picks over the same period. but as a club off the field, and a team on it, they seem to be light years ahead of us. the contrast of watching them play and us is really painful to watch. Plenty of Carlton spporters/ mebers on GC. I use to be one too. Lions have played a few ordinary games similar to the Carlton performances we dont accept. They started to show improved performances earlier in he season, albeit a lot of inconsistently, but they have newfound belief, energy and desire..maybe in their game plan, or they're gelling, or getting fitter....its a lot of things. Its how it happens. I have no doubt it will happen for Carlton sooner than the current results show.